Set six years after the events of “Wreck-It Ralph,” Ralph (John C. Reilly) and Vanellope (Sarah Silverman) are still best friends and hanging out around different games at Litwak’s Arcade. While Ralph is content with life, Vanellope can’t help but want a bit more. Ralph tries to help, but since he’s a wrecker, that leads to Sugar Rush’s steering wheel breaking and the game getting unplugged. Luckily, the arcade just got Wi-Fi, giving the pair access to the Internet and a metropolis of apps, websites, and games. The two have to explore the Internet to find a way to get a replacement wheel before the end of the week, when Litwak will sell Sugar Rush for parts. As someone who was and is the target audience of this franchise (I was 13 when the first film came out), I absolutely love the direction the new film went in. It gives a look into the lives of the characters we know and love and updates their situation to be relatable to today’s audience. Older viewers will connect with Ralph and his confusion of the Internet, while younger viewers will relate by being familiar with all of the different memes and pop-culture references the metropolis of the World Wide Web holds. The way the Internet is portrayed is incredibly diverse, and holds so much potential for content. There’s a segment of the film that takes place at OhMyDisney.com, and includes almost all Disney has to offer, from princesses to Stormtroopers and superheroes. Another part of the film takes Ralph to a video sharing site where he makes viral videos that reference real-life videos. Of course, other real-life apps and websites make appearances as well like Google, Pinterest, Instagram, Twitter and a ton of others. 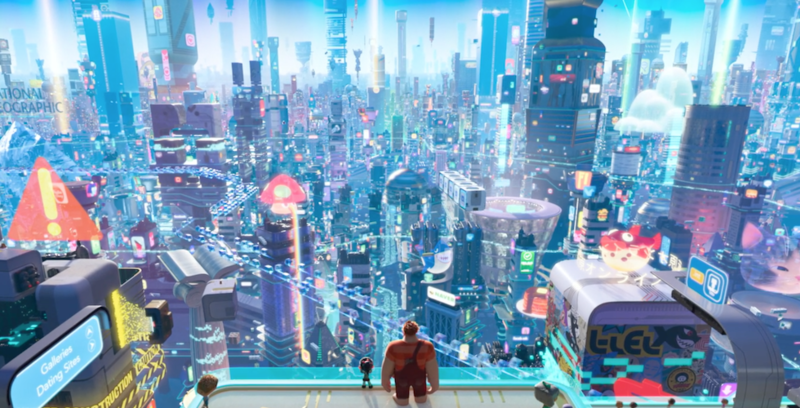 “Ralph Breaks the Internet” is rated PG and runs about two hours. It has both mid- and end-credit scenes, so be sure to stay after the movie to watch. A Ralph and Vanellope meet-and-greet is coming to Epcot, on Nov. 21; over at the Disneyland Resort, the pair is now meeting in Hollywood Land at Disney California Adventure. The digital duo is also currently appearing at Walt Disney World in the Once Upon a Christmastime Parade during Mickey’s Very Merry Christmas Party. At Epcot, kids can enjoy a “Ralph Breaks the Internet”-themed play area at the Family Play Zone. On the Disney Cruise Line’s Dream ship, guests can visit Vanellope’s Sweets and Treats, a gelato and candy store themed to the world of Sugar Rush.